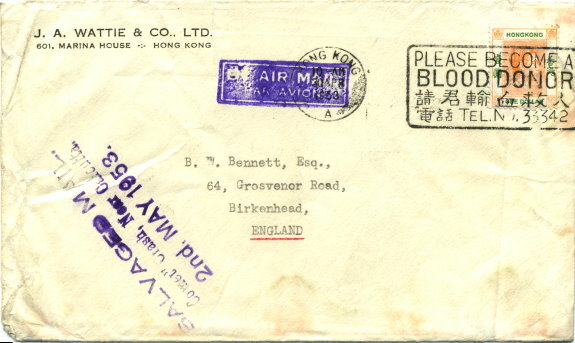 This envelope was posted in Hong Kong on 30th Apr 1953 addressed to Birkenhead, England. It was carried on a B.O.A.C. Comet G-ALVY piloted by Capt Haddon from Hong Kong to London. After taking off from Calcutta on 2nd May 1953, the plane was caught in a hurricane which ultimately caused it to crash less than 50kms from Calcutta. The mail was recovered and the three-line cachet in violet was applied locally before being put aboard a relief plane. SALVAGED MAIL / “Comet” Crash, Near Calcutta. / 2nd. MAY 1953.